This is our fourth and final episode on the Nivelle Offensive of 1917 and will also be quite a bit shorter than the previous two episodes. Today we will cover what happened after the first day of the attacks on the Front. After these attacks fail we will transition to the political arena to look at how Neville tried to deal with the criticism of the French government and was then replaced as French commander by General Petain. This will run us right into the French Mutiny, which will be happening during some of the time period we will discuss today. I have decided to split it into its own separate episode though, we will be shifting all discussion of the mutiny until next time, just note that it will be happening during many of the political conversations that were occurring in Paris before Nivelle was replaced. The biggest question after the first day of the attack was what to do next. 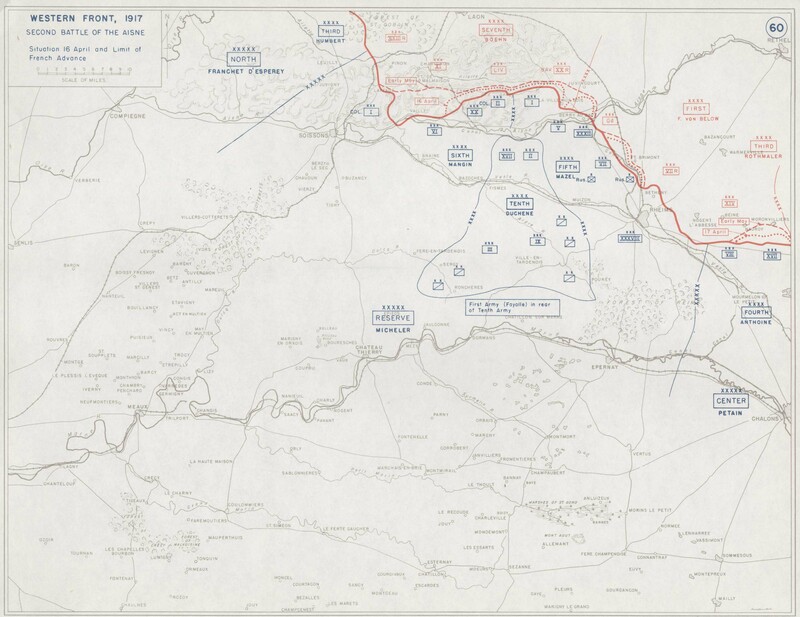 The plan had to change, and Nivelle's initial response was to order a renewed attack with the 5th army as the focus. Nivelle was trying to re-orientate the entire offensive to focus on the right hadn side of the original objectives, this would have been a challenge in the best conditions, but the weather was making it more difficult. Overnight there would be heavy rain at the front, making troop movements difficult, and it would generally add to the fatigue and low morale that the men were already experiencing. This would just make it more difficult to continue the attack. A decision was also made by General Micheler that would be critical to the attack continuing. Micheler was in overall command of all three armies that were executing the offensive and he refused to push more divisions into the forward armies. These divisions were available behind the front in the 10th Army, but it was waiting to exploit the theoretical hole that the 5th and 6th armies would create in the German lines. Micheler adamantly refused to start robbing the 10th Army of divisions because the entire purpose of the attack was to get those divisions through the German lines and into open country. If they were used during the breakthrough attempt, there would be nothing left to push past the lines, meaning that the offensive would be completely pointless. Even without the extra troops the attack would continue at 4:45AM on April 17th. With the weather problems, and just the general problems of continuing an attack, the artillery support available was far less effective than on the previous day. This made any advances by the infantry difficult, slow, and costly. 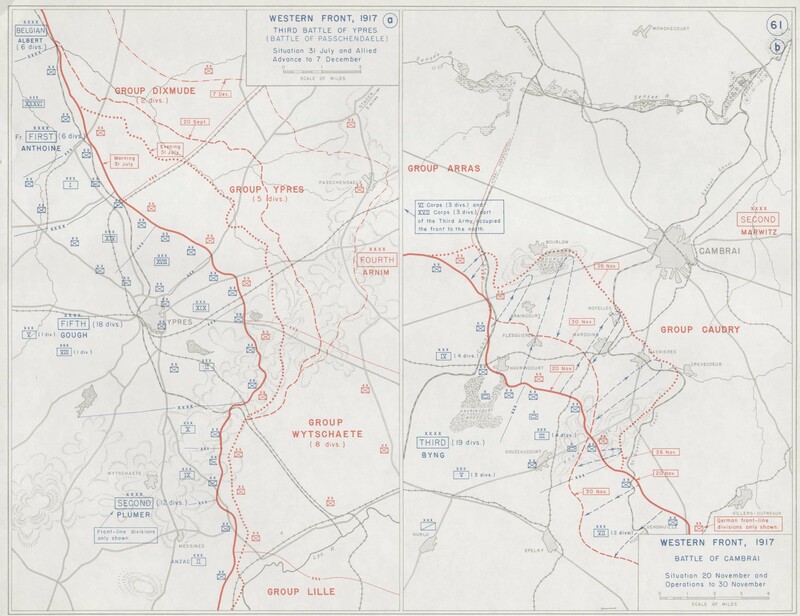 While overall the results that were achieved were negligible, the Germans did withdraw from part of the front. If you remember, there was a part of the front where the German lines rant east-west and jutted out into French territory like an elbow. On the 17th they began to pull back from this area to shorten their liens and make their defensive situation easier. The French would put pressure on the Germans while they pulled back, eventually gaining 7 kilometers of territory, it should be emphasized that this was a voluntary withdrawal, and it was not forced by a French attack. With the second day of attacks not resulting in any huge gains, the expectations at all levels of French command began to drop precipitously. On the 19th Nivelle would have Micheler commit the 10th army fully into the front to try and get the attack moving again, giving up on the larger strategic plan that had been driving the offensive to that point. 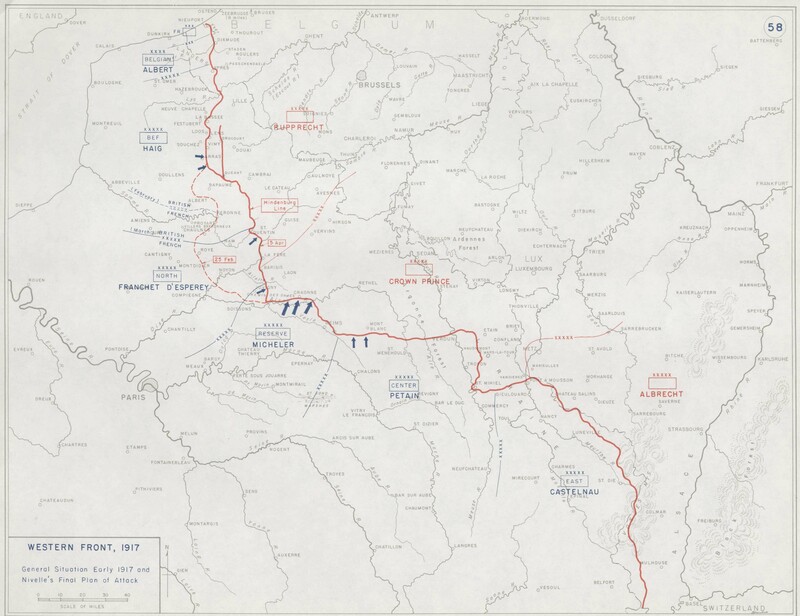 During this period attacks were constantly scheduled, cancelled, changed, and rescheduled as Nivelle and his staff tried to determine some way of resolving the problems they were facing. The clock was also ticking for Nivelle, even if the political leaders back in Paris would not strictly hold him to his 48 hour promise, it did set expectations that were now not being met. What was actually happening at this point, and what many people could see, and what everybody feared, was that this attack was turning into exactly what the previous French offensives had been. An endless slog with heavy casualties and very few real gains, then the attack would eventually fail when the French ran out of men to feed into the meat grinder. We now know that the attack had failed, but the French did not know for sure at the time and the discussion became what to do next. On April 10th Nivelle was in Paris to meet with President Ribot and Poincare to discuss the situation. Pressure had been mounting on Nivelle for several days as it was clear to everyone that plans had to change. Nivelle was unwilling to admit that his offensive had completely failed, even though by now the entire Reserve Army group had been committed to the attack, leaving no maneuver group to exploit the further offensives, even if the initial attacks were successful. During the meeting Nivelle was still trying to hide the severity of the failure from the politicians, he knew that his own credibility with both the government and soldiers was rapidly falling apart but he still hoped that a success would be able to turn the situation around. Ribot an Poincare both knew that the attack had not gone well, even if they did not know the precise details of how poorly it was going, and they were gravely concerned about morale at the front and throughout the nation. They would plead with Nivelle to minimize further losses, even if he would not completely call off further attacks. Over the next few days Nivelle would go to each army group commander and essentially admit defeat. I am sure this was quite humiliating, he was basically switching over to a series of limited offensives. These smaller attacks would only be launched after intense artillery preparations which was strictly an effort to reduce casualties. For those keeping track, this was basically exactly the kind of attack Petain had been advocating for during all of the planning in early 1917. While these attacks were launched, the results were still disappointing at best. This is when the morale of the French army would really begin to collapse. Everybody at the front knew that these limited attacks were pointless, especially when weighed against the successes they had been promised. So in general, the French soldiers were not putting their best into these new attacks. This would also be the point that Nivelle's situation would begin to fall apart as well. Discontent was beginning to spread in the army, and the concerns back in Paris were increasing by the day with flames fanned by reports from the army groups about the situation. While Painleve, Poincare, and Ribot were not quite to the point of replacing Nivelle, they were going to make some changes. The largest of these was the appointment of Petain as Nivelle's Chief of Staff. This appointment would serve two purposes. First, it would put somebody on Nivelle's staff that the political leaders knew had opinions that were very much not in line with Nivelle's, hopefully to act as a counterbalance. Second, Petain was basically guaranteed to succeed Nivelle, even Nivelle knew that it was just a matter of time. Nivelle actually supported the move under the belief that it would give him some time to step away gracefully. While Petain would benefit from the plan, he initially did not support it because he did not believe that Nivelle should remain in command any longer than he already had been. Petain was eventually convinced and would take the position of Chief of staff on April 29th. With this appointment Petain was now also involved with all meetings with the political leadership, which meant that he was at the next meeting on May 4th. During this meeting, also attended by Italian, Russian, and British representatives, Petain would downplay the French failures but he would admit that there was no possibility of a breakthrough or a large strategic success. While Nivelle believed that the appointment of Petain would give him some breathing room the transition was about to occur far quicker than he had hoped. The hammer would fall on May 10th, when the Council of Ministers agreed with Painleve's request for Nivelle's immediate removal. In these situations the person who was asked to resign generally would, but in this case Nivelle refused. He would tell one government official that "They want my hide…but neither my dignity, my conscience, nor my sense of what I owe my country permits me to play their game." This put a spanner in the works, and it was something that was not really expected and so five days would go by where Nivelle would stay in command while Poincare and Painleve sorted out how to just remove him. On the 15th of May he was named as an Army Group commander, but with every Army Group currently having a commander, he was instead put o n leave, and then later dismissed. That is not where the story of Nivelle's removal ends though. Petain would arrive at headquarters on May 17th to officially take command, and at that point Nivelle would officially resign. But instead of promptly leaving Nivelle just sort of hung around for a few days, he would in fact not leave until May 19th. He had nothing further to do at headquarters, and nobody seems to know why he stuck around, but he did not leave. When he would leave he just sort of exists our story. In December 1917 he would be posted to North Africa which basically removed him from the war. Before we end today, we need to talk about the costs of the Spring 1917 Entente offensives, for both sides. While the French and British experienced their own singular actions, for the Germans they were forced to absorb 6 weeks of large Entente attacks. The Germans had stopped them, again, but it was also quite costly, again. In total the Germans would suffer somewhere around 165,000 casualties. In his book The German Army in the Spring Offensives 1917: Arras, Aisne, & Champagne, Jack Sheldon would say that "During a six week period, OHL had rotated no fewer than seventy divisions into the front line along the Western Front. 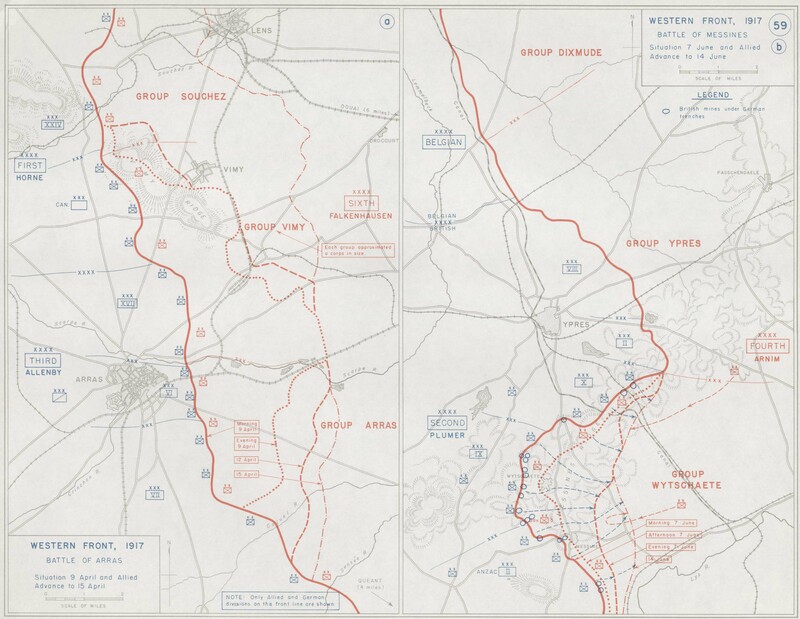 They were all to a greater or lesser extent worn down, there were no completely fresh formations and the British, having continued to press hard and sacrificially east of Arras, were about to begin major operations in Flanders. Furthermore, both the field and foot artillery was still committed to action on both army group fronts and expenditure of ammunition continued to be prodigious. There simply was no possibility of creating the size of fully supported attacking force necessary to make an impact on the French army and to exploit this opportunity." These attacks basically put the Germans into a position where they were unable to do anything meaningful on the Western Front for the rest of the year. This is critical when you consider how vulnerable the French army was after the attacks. This is a situation that Ludendorff would address after the war in his memoirs "The French offensive had been smashed in an extraordinarily bloody fashion … and the mood of France was subdued. In July the Minister of War admitted the offensive had failed with such high casualties that it could never be repeated. The [defeat] was so great that the morale of the army began to suffer and mutinies broke out. However, information about them was scanty and only gradually came to our attention. Only later did we have a clear picture." With the 3 years of relentless Entente attacks not yet over, there was still the hell of Flanders, these experiences would greatly influence the German plans for 1918 as they desperately tried to find a way to break the cycle of endless siege in the west. For the French the attack was a disaster both for morale and in terms of casualties. In the 9 days between April 16th and 25th, when the offensive was still being pressed by the French, they would suffer 134,000 casualties. This would make it the worst month of the war since November 1914 for the French army. It was worse than their complete failures in 1915, worth that any single month of Verdun or on the Somme. When you add this number to the 160,000 casualties experienced by the British it becomes apparent how huge the failure really was. For the French the problems ran far deeper than just numbers. By the end of the month reports were trickling back from the front that troops were resisting orders to move forward. There were troops shouting "Peace! Down with war! Death to those who are responsible!" The French Army, or at least pieces of it, were starting to mutiny, and it was only going to get worse. That will be our story for next episode, as parts of the French army descend into anarchy, and the man entrusted with putting the pieces back together and saving the French Army was Petain.